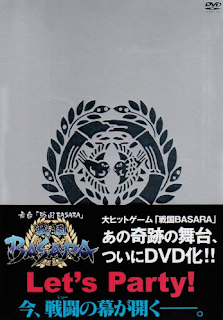 The Sengoku Basara stage plays have become a highly successful spin-off series over the course of a few years. 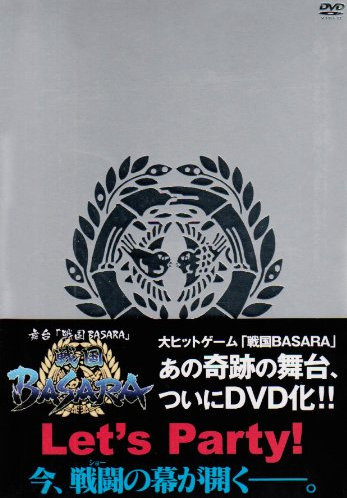 For this review I travelled back in time to see how it all started, by watching the very first Butai Sengoku Basara on DVD. This original Sengoku Basara stage play was performed for a short period between the 3rd and 12th of July 2009, at Tokyo Dome City's Theatre G-Rosso. A DVD recording of the show followed on 2nd October 2009 in both standard and special editions. Although both editions are now out of print they're not difficult to find on the used market with a little patience. I have the special edition; the only difference is that you get a colour 'Limited Edition Photo Book' and a special slipcase to hold everything together. The photo book is nice, but thin - unless you're a big fan of the actors there isn't much reason to pay a lot more for a used copy of the special edition. 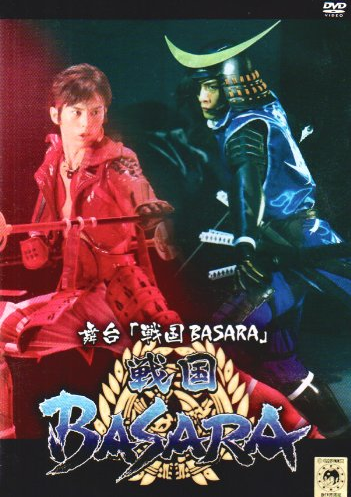 I should also point out that this is the only Sengoku Basara stage play which spawned its own CD soundtrack. It's spread over two discs and is mostly made up of a jumble of tracks pulled from various different games in the series, making it a good CD to start with if you don't have any other the others. It's easy to find even now. As the short cast list implies, the huge number of characters in the Sengoku Basara world was whittled down to the bare minimum for this adaptation. Most surprising of all for me is the omission of Takeda Shingen; although Yukimura still has Sasuke to keep him company, the exchanges between the young tiger and his master are some of the most memorable scenes in the series. Speaking of Yukimura, he's the only one of the leads whose actor has been changed since this original outing. Hosogai Kei has done such a good job bringing him to life in the more recent stage plays that I had trepidation about how I'd respond to Kataoka's early effort. His take on the character is much more serious than I'm used to; more like the Yukimura I often see in movies and dramas than the overly-earnest Basara version. It's not really fair to judge Kataoka based on this one performance when everyone was still settling into to their roles as well. Having said that, I came away a little disappointed by this very different portrayal of the young Tiger. Since Oyakata-sama is missing and Yukimura is behaving more sensibly than usual, the one who gets to shine as a result is Sasuke. His carefree lines sound all the more cheeky when he's saying them to such a serious danna. Sasuke is often sidelined in the later stage plays due to the sheer number of characters involved, so it's a pleasure to see him with more lines than usual. Fans of Murata Youjirou will also be delighted by the very end of the performance, when Kataoka leads the other staff members in an embarrassing celebration of the actor's birthday on stage. Interestingly, Nagasawa Nao and Shiina Taizou would later reprise their roles as Nouhime and Ranmaru in this year's television drama Sengoku Basara -Moonlight Party-. I thought that both were excellent; Nagasawa is a stunningly beautiful woman and a great fit for Nouhime, while Shiina brings Ranmaru to life with playful flips, handstands and (when provoked) the occasional yell. He's much taller than the game version of the character; I suspect that a scrawny guy would struggle with the character's savage fighting style. Rather than attempting to hide his build, he captures a sense of Ranmaru's boyishness through his gestures and speech. Kubodera made a surprisingly good Nobunaga too. His costume is the fanciest of the lot (and something of a safety hazard with all of those spikes). He remains appropriately imposing as he bellows his way through Nobunaga's lines, playing off Ranmaru especially well. It's harder to judge the other actors evenly as I've seen what they're capable of in the later stage plays. Both Kojuurou and Masamune were fun to watch but somehow they felt more subdued than normal, as though they weren't comfortable enough to go crazy with their performances. I can't say whether this might have been down to it being the first show, or whether they were simply physically exhausted from the sweltering heat on stage. I must say that Yoshida Tomokazu is intimidatingly good-looking. With this being the first stage play in the series, the costumes, wigs and effects are much more primitive than the refined efforts I've become accustomed to. Yukimura's costume looked downright flimsy at times; since Kataoka was sporting some impressive muscles my eyes were immediately drawn to the faults with the outfit flapping around on top of them. It was also obvious that poor Mitsuhide was having more trouble with his wig than with the enemies he was fighting. The DVD production wasn't the best; the music sounds good but the actors' lines are sometimes tinny and occasionally difficult to make out. It's not a bad DVD at all, it's just that the later stage plays are so much better that I know what I'm missing out on. The disc runs for 175 minutes in total, which contains the full show and 30 minutes of bonus materials. The play is split into four acts with an opening, ending and curtain call. There's no voiceover for the special footage, but you really get a feel of how intense the atmosphere was backstage; the actors are constantly practising and having their costumes adjusted in the blazing summer heat. The professionalism of everyone involved is incredible. Poor Kataoka is shown to have been suffering from a terrible foot injury and it's only once he's left the stage that he allows himself to sink down and let the pain show on his face. He also shows off a number of scrapes and bruises from the fight scenes. The bonus footage demystifies the backstage arrangements with shots of stunts being performed and makeup being applied. There are also some clips of the actors warming up and training with their weapons. They're so focused and agile! My final impressions of Sengoku Basara's initial foray into the stage play world are that it's an interesting first step. Taken as a whole, I felt that the pacing suffered in that the first half was packed full of fights with regular soldiers when what I really wanted was to see the leads square off against one another. This was rectified at the end when we finally got to see the heroes decisively triumphing over the Oda army. Because the cast was so small, there wasn't much variety in the battles. The memorable humour of the later stage plays was also almost completely absent. In its place there was perhaps more focus on impressive acrobatic feats. I'm looking forward to watching the 2010 follow-up next, which is the same show with some adjustments to the cast and individual scenes. It's the stage play which bridges the gap between this first attempt and 2011's magnificent Butai Sengoku Basara 3. My expectations are high!